At 42″ in height and 38 Kg the Emperor Penguin is the largest species of penguin. Their life cycle starts in the early austral winter (April/May) when the penguins congregate at the former rookery sites on the newly forming ice platforms. Until recently it was thought that these rookeries only existed on ice adjacent to the Ross sea, but satellite imaging has led to the discovery of rookeries, that are much more accessible, particularly around the Weddell Sea such as Snow Hill Island which was in fact only discovered in 2006. It is essential to the penguins that these rookeries are formed on ice that will break up the following spring allowing the chicks easy access to the sea. The adults will have been feeding all summer and will typically be 10 Kg overweight at this point. They participate in a rather beautiful courtship ritual or pair bonding, that can still be seen later, as depicted here, when they have a chick, where the two adults mirror each other bending their necks in a synchronised movement. 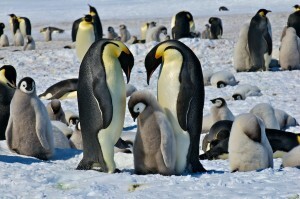 The single egg is laid by early June at the outset of the coldest weather, when uniquely the male takes responsibility for the 66 day incubation period. He carries the egg between his feet, in a fold of his abdominal skin. The males in the colony obtain further protection from the cold by huddling together and rotate their exposure to the worst of the conditions. The males can loose up to 45% of their body weight during this time while the females are away. When the chick hatches, they receive their first meal from the male in the form of a special secretion of fat and protein from his crop. The female then returns with a full crop with which to feed the chick. For the next few weeks the chicks are fed alternatively by both parents both of whom make the long journey over ice to the open sea. From what I observed at Snow Hill, although there are remarkable acts of recognition between parent and offspring, crecheing involves sharing some of the responsibilities between 2 or more pairs, although this may not have extended to feeding. At a certain point, probably dependent on ice breakup, the chicks moult and are suddenly required to fend for themselves. They must go to sea to obtain their own food.